The versatility of helicopters is usually put to effective use in several sectors throughout Kansas, including agriculture, industrial, mining, telecoms, construction, and utilities. Heavy lift helicopters are the preferred mode of transport for emergency evacuations like firefighting as well as routine tasks such as transporting personnel and equipment. They are the perfect match for HVAC installations, thanks to their high degree of maneuverability and ability for precision placement of heavy items. For small tasks and large, FairLifts can pair you with the helicopter, pilot, and crew to meet your heavy-lift requirements across the state of Kansas. Sikorsky helicopters have a maximum lift capacity of over 4500 lbs and are the perfect match for rescue operations as well as heavy lift tasks as well as relief operations. The Bell 214-B is acclaimed as the world’s most powerful single-engine helicopter. It is often used for heavy-lift missions in the construction industry, as well as disaster relief, fire-fighting, and salvage operations. Huey helicopters are most suited to personnel transport, including medevac services and equipment haulage in hot, remote environments. While Kansas landscapes are mostly beautiful plains and parks, helicopters come in handy during times of thick snow and ice, or any time you want speedy service. Helicopters are capable of a variety of movements – sideways, backward, forwards, and straight up and down. They are far more flexible than fixed-wing aircraft over uneven terrain and capable of lifting very heavy and bulky objects. Helicopters are the best way to get the job done in difficult terrain and tight spaces. When you hire a helicopter through FairLifts, you will be consulted about the best and most cost-effective way to reach your goals. Experienced pilots, mechanics, and crew are hand-picked to deliver the exact service you need, within your time constraints. Thanks to a network of service providers, we can offer comprehensive helicopter heavy lift services anywhere in Kansas. Helicopters can easily match the tasks performed by land-cranes when the going is tough, or costs are limited. With no set-up and take down costs, helicopters are both cheaper and faster than land cranes. 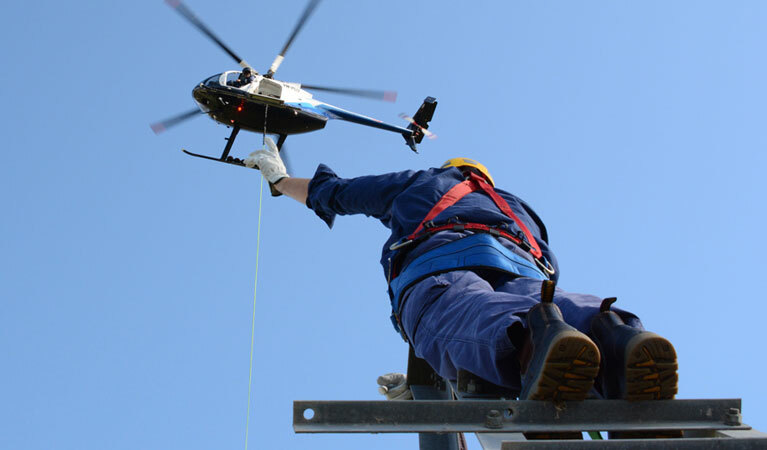 Versatility, precision and an excellent safety record, make helicopters the first choice for antennae and communications tower installations in Kansas. Helicopters can easily access high rooftops or busy roadside verges for the placement of advertising billboards. There is little disruption or danger when you make use of heavy lift helicopters for installing these items in high traffic and built-up urban areas, such as city buildings or busy highways. Remote locations, mountains, watercourses, snow, and ice can make it difficult and costly to transport goods and personnel to the desired site. In these instances, road transport is a costly, dangerous and time-consuming exercise. Helicopters deliver anywhere with ease and are an excellent solution for medevac services. Transporting provisions, personnel, and heavy structural elements through heavy going to a remote construction site can be a logistical nightmare. Helicopters are a top choice for pouring concrete from above and can move people and heavy items quickly and effectively in almost any conditions, making them a popular choice at any stage of the construction process. Big job ahead? Need helicopter-powered heavy-lift solutions? It’s clear that helicopters are the answer to your heavy-lifting needs in Kansas. For ultimate convenience, FairLifts friendly call center agents are available 24/7 to take your call. Get in touch and let’s talk about how we can make any job easier for you.